It’s weird that it’s time for San Diego Restaurant Week again ALREADY. Like what. But hey that just means it’s time for awesome deals on awesome food! 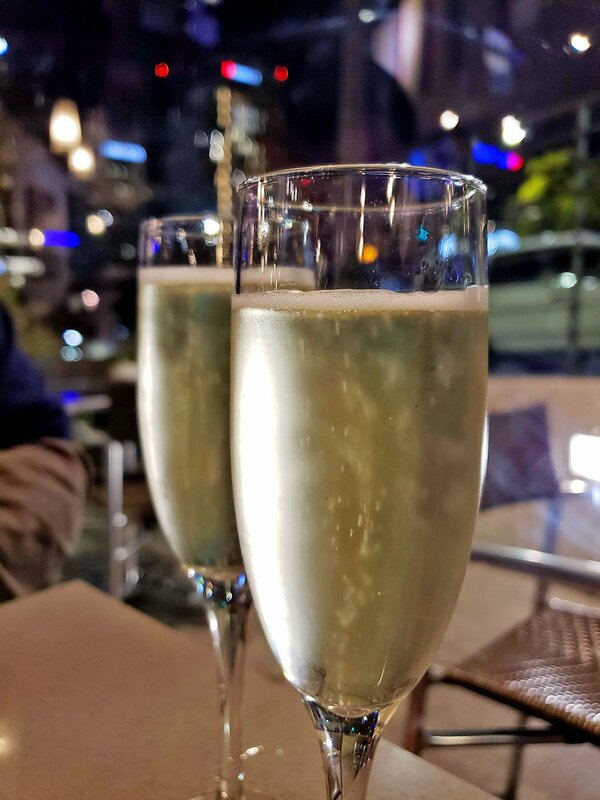 This time around I was invited to check out SoleLuna Cafe, which is located in the Cortez Hill area of Downtown San Diego, not far from Symphony Hall if you have no idea what I’m talking about (I didn’t know). It’s here! Right in front of El Cortez! It’s pretty cute inside. And there’s a bit of outdoor seating as well. I liked that it was far away from the bustle and hustle of Gaslamp. Parking was a lot easier in this area! 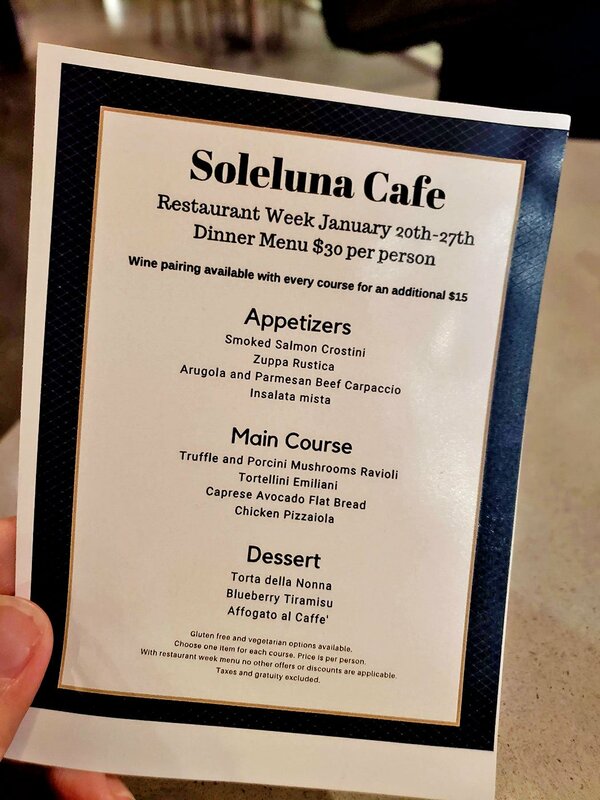 This is the menu for restaurant week at SoleLuna Cafe. $30 per person for dinner! Plus you can add wine for a little extra something something. 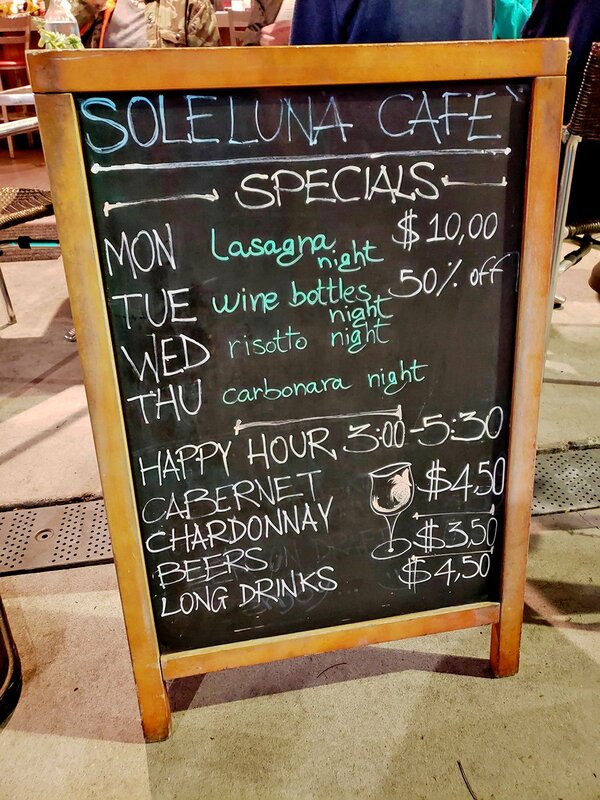 Quite frankly I want to return to check out SoleLuna Cafe’s lasagna night. Doesn’t that sound awesome?! The owner told us lasagna is their best selling item. The owner was our server for the evening and he was nice enough to offer glasses of prosecco to start off the night! Jake drank it but he wasn’t really a fan. On the other hand I liked the sweetness of the prosecco and thought it had a lovely flavor and fizz. Would drink again. A+. 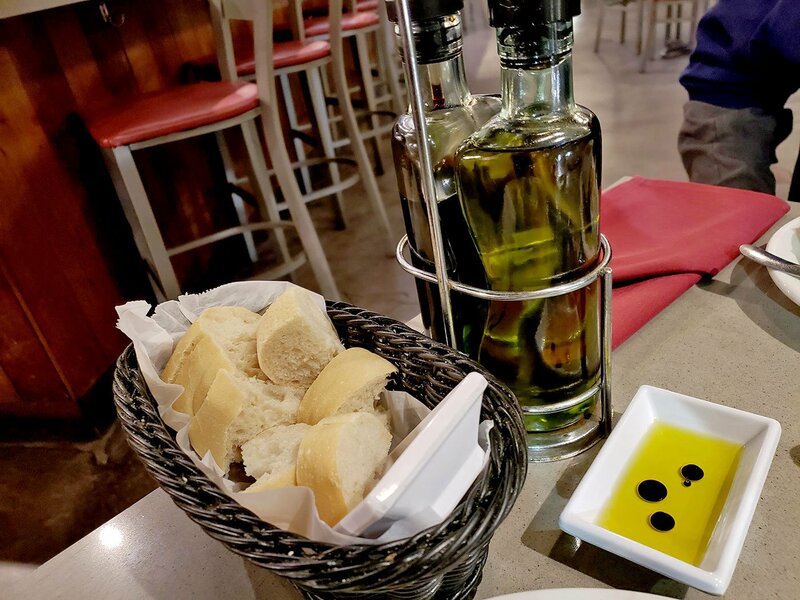 We also got a little basket of bread and tiny plates for olive oil and balsamic vinegar. 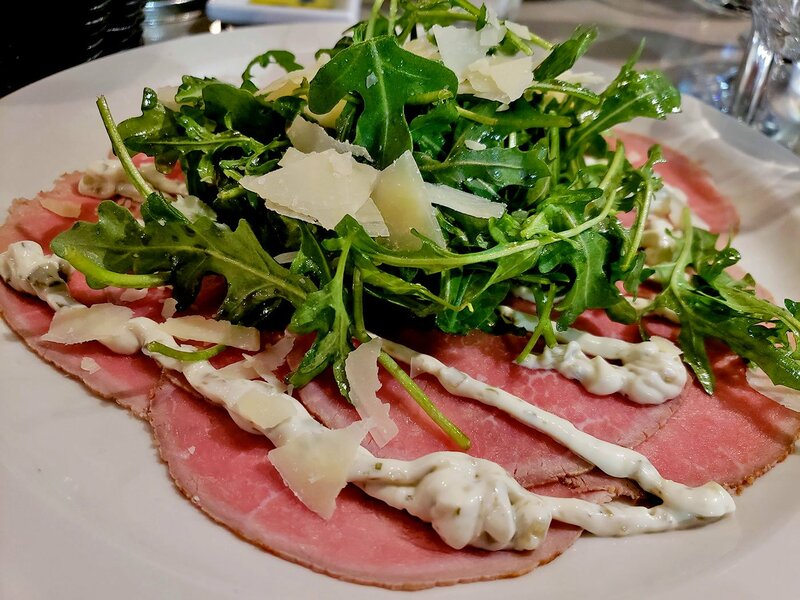 I started off our meal at SoleLuna Cafe with the Arugula and Parmesan Beef Carpaccio. You probably know I’m not a big fan of arugula but I do like carpaccio so I figured I could eat around it. I had a little bit of arugula and it was eh. The carpaccio was yummy though. I didn’t really care for the white sauce that came with the carpaccio but eating the carpaccio on top of a piece of bread soaked in olive oil was excellent. I made my own appetizer! Bread and carpaccio! Jake choice to get the Zuppa Rustica which was a vegetable soup with crazy large beans in it! The owner couldn’t remember what the name was in English (he is Italian) but I think they might have been fava beans. 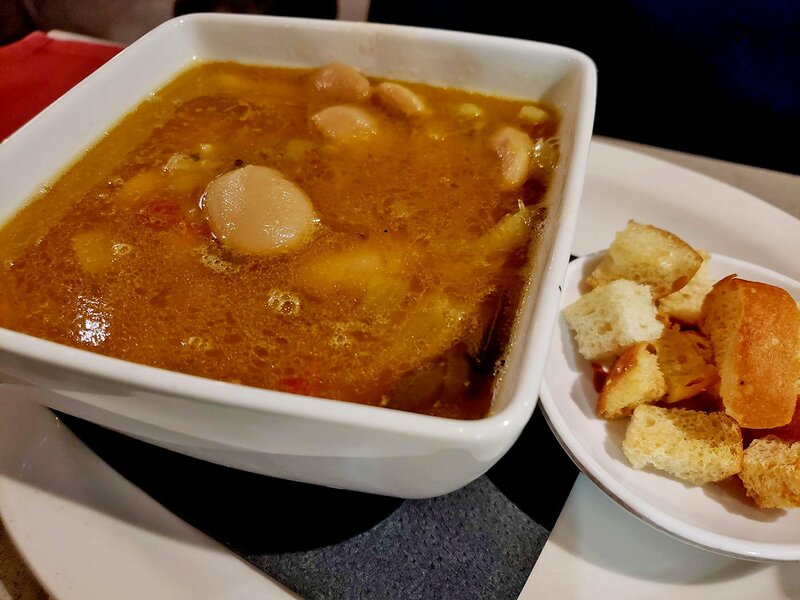 The beans were creamy inside of this flavorful soup and I liked that it came with some croutons on the side. For the entree, Jake choose the Chicken Pizzaiola. Honestly I think he picked it because it has “pizza” in the name! 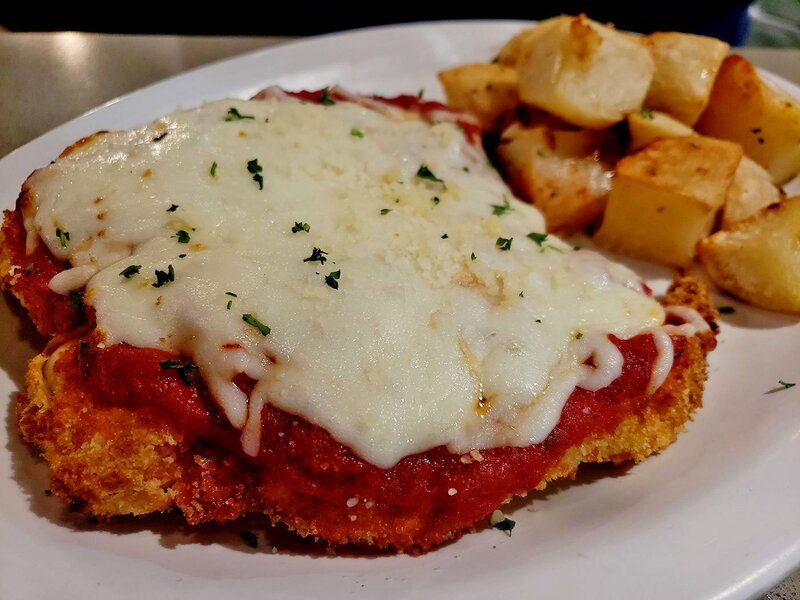 The owner explained to us that this dish is like Chicken Parmigiana, but instead of Parmesan, they top the chicken with mozzarella. The chicken breast was crazy large and really tender. The breading was nice and kept the chicken flavorful and yummy. Jake really dug the tomato sauce on top with all of that delicious cheese! It’s served with a side of yummy golden roasted potatoes, too. This is a great option if you’re not feeling like having pasta but your dining partner wants pasta! 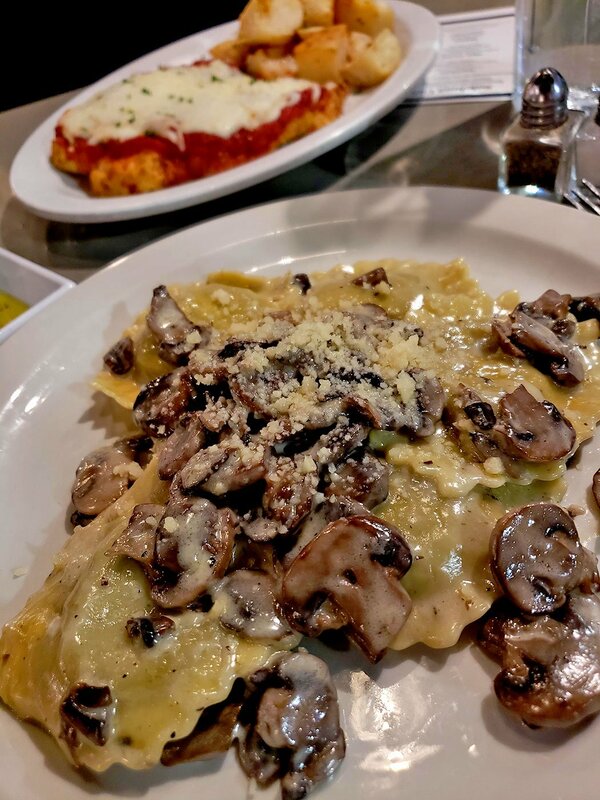 I only had eyes for the Truffle and Porcini Mushroom Ravioli. As soon as I saw “truffle” and “mushroom” I was sold! This is really a dish for mushroom lovers because the ravioli is stuffed with a creamy mushroom mixture and you get mushrooms ALL OVER THE TOP. It is mushroom heaven! The creamy sauce on top is light, allowing the mushroom and truffle flavors to shine through without being drowned out in a heavy cream sauce. Jake, my mushroom hating fiancé, actually tried the ravioli because he thought maybe they were stuffed with something else…. but nope. I did warn my fiancé about the mushrooms but he went ahead anyway. It’s safe to say that no, he still isn’t a fan of mushrooms. Ha! For dessert I tried the Torta alla Nonna because Jake ordered the one I intended to order. 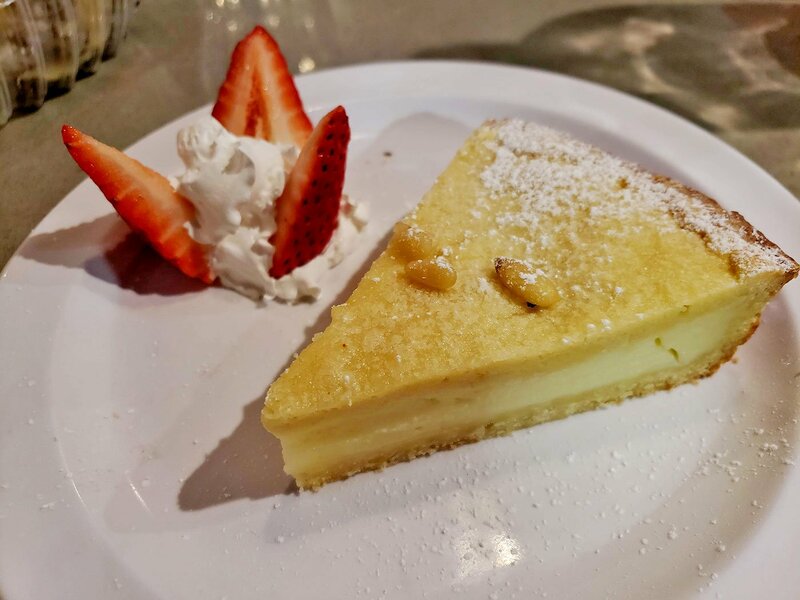 The torta alla nonna has a creamy base with a light crust and a few pine nuts on top. It was simple, not too rich, just sweet enough, and an excellent overall flavor. The owner told us this is his current favorite dessert (it changes from time to time haha) and I could see why. It’s simply delicious and a nice way to end the meal without having something too heavy or crazy sweet. Jake ordered the Blueberry Tiramisu and I loved how this dessert looked! The color of the blueberries really pops on top of the creamy top and I liked that they incorporated fresh blueberries into the dish as well. 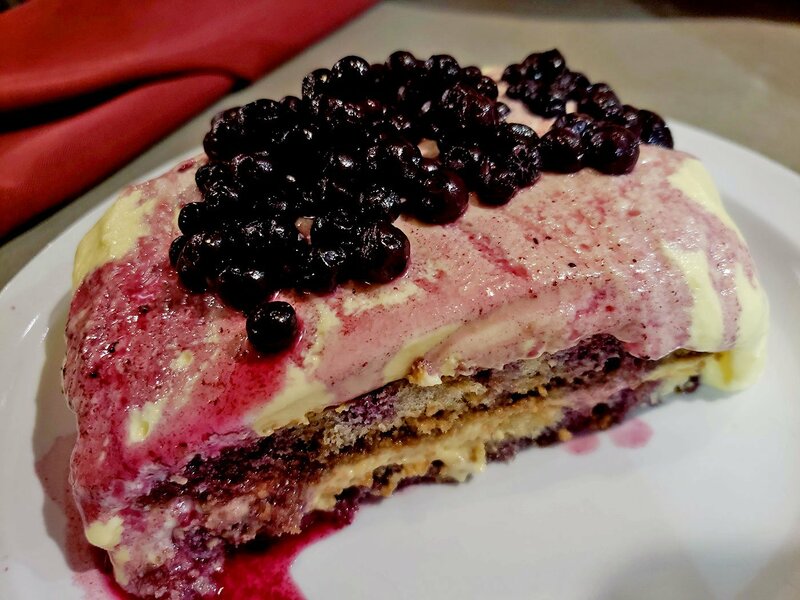 The tiramisu still had the distinct coffee flavor that the dessert it known for, but with a fresh, bright taste of blueberries in the dish. It’s soft and creamy and I really enjoyed this dessert as well. It’s hard to say which dessert I preferred, honestly. They were both so good! All in all Jake and I had a really lovely, quiet dinner on a Sunday night here at SoleLuna Cafe. The owner told us it gets busy when there’s a concert happening over at Symphony Hall so plan accordingly if you plan to check out SoleLuna Cafe during San Diego Restaurant Week. San Diego Restaurant Week starts this Sunday January 20th, 2019 and runs through the following Sunday on January 27th. Check out the San Diego Restaurant Week website to view restaurants that are having a special menu and be sure to check out SoleLuna Cafe! Disclaimer: I was invited for a complimentary San Diego Restaurant Week meal on behalf of the restaurant. I was not further compensated for this review and all opinions stated here are my own. I’ll go with you for lasagna night! I just remembered it wasn’t on the SDRW menu so I still need to try it! Glad you enjoyed your meal!